Most homeowners are aware of natural gas heating systems and electric heating systems–however, there are several more ways to heat your home. The cost of home heating repair is also something to consider when you’re searching for the best option. Read on for some helpful information regarding how to heat your home. Natural Gas: This form of heating requires a fuel supply and a permanently lit pilot light (like the ones used for gas stoves). When a home’s temperature falls below a certain point, the furnace switches on and begins to heat the home. For this reason, 24 hour furnace repair services are your best bet when it comes to maintenance. Electric: This uses heated coils over which air is pushed. This heats the air and distributes it throughout the home. However, this form of heating is not environmentally friendly, as it burns coal and fossil fuels. It can also be the most expensive option. Geothermal: Pipes are drilled deep into the ground; because the temperature of the Earth stays constant year-round, this provides an incredibly reliable heat source. While the initial cost can be as high as $30,000, it’s important to note that the environmentally-friendly aspect of geothermal heating can present you with sizable tax credits at the end of the year. There will also be less repairs, and pipes last for several decades. Heat pump: Rather than suffer from high electric heating rates, you could use a heat pump, which condenses heat from the air inside or outside your home, depending on the season. It works best in temperate climates, as it doesn’t function well in frigid temperatures. This can significantly lower the cost of your heating bill. Boiler: Small, older homes will usually run on a boiler heating system. It relies on heating pipes via steam created in a central boiler. It’s cost-effective, but requires more frequent and intensive home heating repair. Each of these has its costs and benefits, although natural gas is the most popular way that most Americans heat their homes. Regardless of which system you’re using to heat your home, it’s important to remember that you’re going to need repairs. In particular, having access to a 24 hour furnace repair service can ensure your heating system is functioning properly. In Long Island NY, temperatures can fluctuate wildly throughout the year. 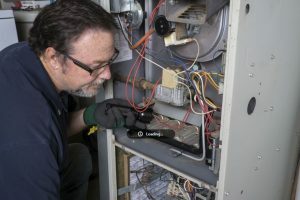 It’s likely that your heating system might experience some wear and tear, requiring 24 hour furnace repair service sooner and more frequently than you might think. Make sure than your Long Island NY home is receiving the maximum heating system care throughout the year.